by the Italian firm which printed his death notice cards. Ordained to the priesthood June 29, 1909, by Bishop Denis O'Donaghue, at Holy Family Seminary in Oldenburg, Indiana. Click here for new 2006 photos. Website contents are largely compiled from photos and historical information contributed by Annabelle Coughlin Laudeman, great-niece of Fr. 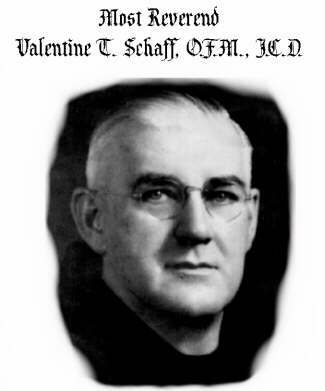 Valentine, inherited from her paternal grandmother, Dorothea Schaaf-Coughlin-Schmidt, sister of Fr. Valentine. Other images and information are credited where the source is known. Dreamweaver site by Bill Laudeman. ©2000 - all rights reserved. Please E-mail corrections and comments.